NEW YORK: The iconic Times Square in New York was seeped in the colours and tradition of the Sikh culture as members of the community tied turbans to thousands of New Yorkers and tourists to spread awareness about the Sikh identity amid a spike in hate crimes against them in the country. 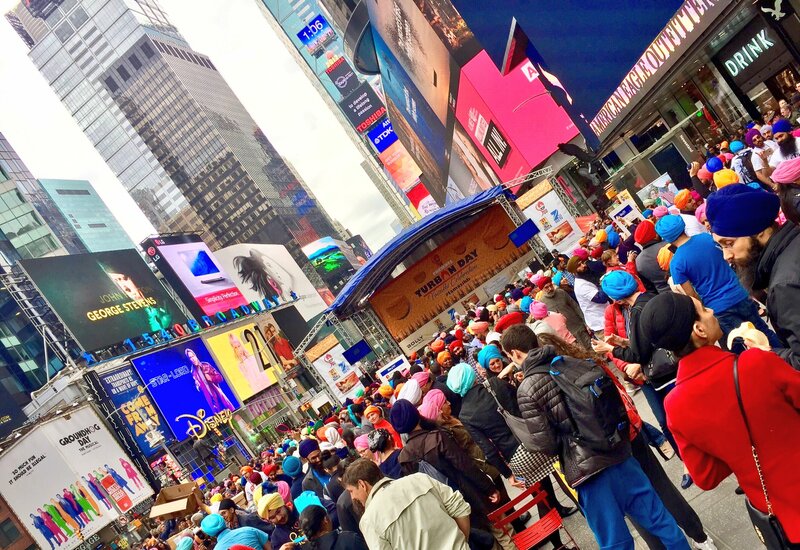 Non-profit group ‘The Sikhs of New York’ organised the ‘Turban Day’ at Times Square yesterday, with its volunteers tying colourful turbans to close to 8,000 Americans and tourists hailing from different nationalities and ethnicities. The four-hour event, held as part of Vaisakhi celebrations, was aimed at spreading awareness among Americans and other nationalities about the Sikh religion and its articles of faith, especially the turban, which has often been misconceived and misidentified as being associated with terrorism particularly in the years since the 9/11 terror attacks. During the event, a proclamation by Congressman Gregory Meeks of the 5th Congressional District of New York declared April 15, 2017 as ‘Turban Day’, lauding The Sikhs of New York for its dedication in educating other communities about the Sikh faith. The organisation’s founder Chanpreet Singh told PTI Turban Day was started in 2013 at Baruch College to promote and educate people about the Sikh religion and identity. “We are spreading awareness about the Sikh turban and culture. The turban is the crown of each Sikh and represents pride and valour. Turban Day provides an opportunity for those that do not wear a turban to experience a turban and learn about its significance first hand,” he said. Mr Singh added that he had personally experienced hate during his school years and wanted to take the initiative to educate Americans that “Sikh values are American Values”. He said by inviting people from other nationalities to wear the turban, the event also aims to encourage them to avoid discrimination and speak out against hate crimes targeting Sikhs in America going forward. As Sikhs of New York volunteers tied colourful turbans to excited New Yorkers and tourists, they explained the significance of the Sikh article of faith and informed them of the reasons why Sikhs wear the turban. They also shared information about the Sikh culture and traditions. Those who got the turbans tied, including children, were seen excitedly taking pictures and proudly walking around with their new head gear. Fallon Mendz, a young student, said she got the turban tied on her head as she liked exploring different cultures. “It’s nice to see a different culture. I am not a Sikh so it’s nice to learn about different cultures,” she said, proudly wearing her pink turban. She added that the message of the organisation that Sikhs should not be targeted in hate crimes because of their identity is “amazing”. “Everyone should be treated equally, everyone should be welcome no matter what religion you believe in,” she said. The organisation, which has about 600 members, also unveiled a new video featuring Sikh physicians and businesspeople sending a message that while Sikh people have different backgrounds, they are not terrorists. UK based artist @Inkquisitive is painting the largest ever Sikh mural to mark #TurbanDay in Oslo, Norway ? ?